Boy, I need a tan! If you flip a few pages to the table of contents they have the pic again, along with the photo credit. Previous Post14 Days of Fonts Next PostSome new pics! Hi Amanda. I stumbled across your blog a few months back while looking for a camera bag. I have a bad habit of just throwing mine in my purse..OUCH. I have been addicted ever since! I purchased your BIG back pack & I love it! I just picked up the Understanding Exposure book this week. Very helpful!! Im going to Purchase the 24-70 lens this week. Im still learning to use my camera & REALLY want to be a better photographer. Your How To’s really help me learn how to navigate my camera. Needless to say your kinda an inspiration to me & I just wanted to say thanks for helping people like me!! Congratulations! 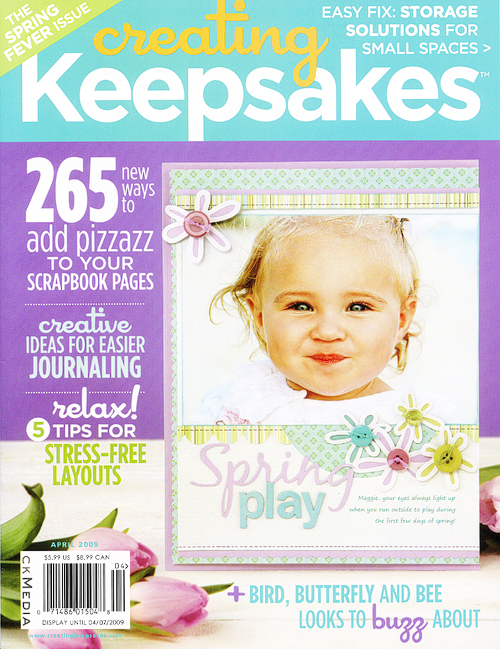 My name is Grace from Sunny Townsville Queensland Australia and guess what I have that Creating Keepsake Magazine that you are referring to. I actually followed that lay out (front cover) for my 2 year old’s picture. Amazing! Well keep up the good work and I love your site girl. God bless you and your family. WOW, congrats! Your website is getting HUGE! I know I love it. 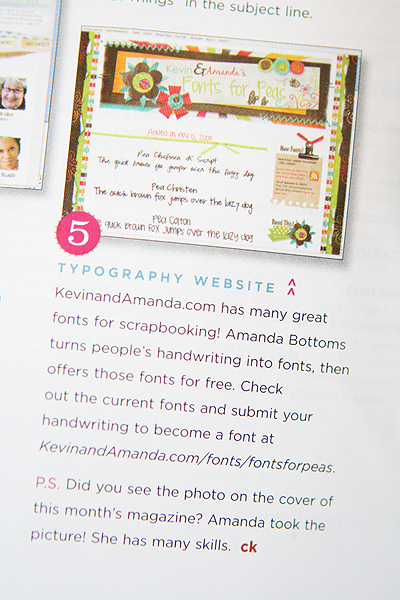 I learned about kevinandamanda.com from my professor, when I was taking a class specifically on children with special needs a few semesters ago. We were talking about ways to help kids with special modifications, and she suggested your site to turn the handwriting of kids with special needs and must type everything due to a disability into a font, so that when their peers produced handwritten work, they could theoretically do it, too! She also scrapbooks and said your website had much more stuff, too. So I got online, found you, and I’ve been in LOVE with the site ever since… I’ve started blogging myself, and although my blog is more like a journal and no where near as fun and helpful as yours, I’m loving it! Thanks for all your inspiration & CONGRATS! HOW COOL! I recognized that picture immediately! I am doing the happy dance for you sweet friend! It was truly a pleasure and SOOOOO much fun to do a girlie page (I have all boys!) and I hope you feel I did it justice! All the best! your work was show at that magazine!! and i have used many!! I hopped over from 2 peas. I feel like I “know” someone famous now. So cool! I dream of getting published. But a cover – – wow!! Wow! Congrats Amanda (that’s my name too), haha. I would only DREAM of this happening. that’s SO great! :) congrats! This is fantastic. Congratulations on your achievements. I absolutely love the “Fonts for Peas”. I can see why he included it in the magazine. Congrats to you! You definitely deserve the recognition for all of your creative and talented work. I will be picking up a copy of the magazine today. You go girl! Congrats, Amanda! 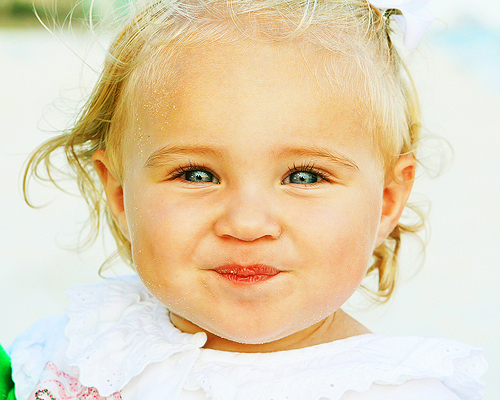 She is such a little cutie, and perfect for the cover! I also love your website, and you truly deserve the recognition! Congrats Amanda!! That is fantastic! CONGRATULATIONS AMANDA!!!! What an awesome honor. I can’t wait to go get my personal copy…will you autograph it for me?? They should do a cover with your “boys” next. That would be really cute too. Congrates! I love your website, you deserve the recognition for some ofyour many talents. I consider this a GOD hug, he always takes care of us! So totally cool and well deserved….now whatcha gonna do??? Reach for the stars girl!!! I’ve turned into a Pea font junkie and everyone on my staff was dying to get their hands on my fonts…!!! Fantastic for you! Congratulations girl! You definitely deserve to be recognized for your talents & creativity! When you posted that picture a while back it made me want to learn more about photography. Great job! How wonderful! That is really something special, and you should be proud. Congratulations! Oh- I used Pea Stacy for Ella’s 5th b’day invitations and it turned out so cute! I used Pea Jenny Script for her party favors. Just precious! Amanda…you are soooo talented and am glad that you are getting some big time recognition. Have always admired your photography and the photo of Amerie is just wonderful. I imagine that you and her parents are buying up all the magazines they can find. Here’s to more fame! 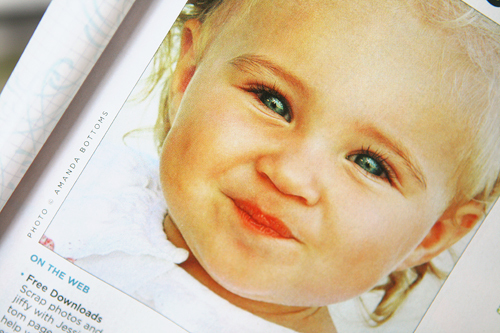 I got my CK magazin a few days ago and was amazed by those sweet blue eyes. Sooo cool to see your stuff in a magazin. Congratulations to you and Kevin. God has surely blessed you! Keep up the good work. I hope to see more of your work published!! Congratulations Amanda! I found your blog last year when we moved in our new home. I was looking for ideas for a scrap room and have been with you ever since. I loved that picture along with all the other ones you share. Not to mention your fonts. Thanks for sharing with all of us. Awesome photography skills! Congrats on being on the cover! 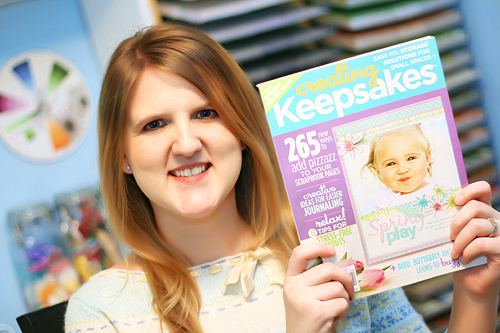 How wonderful to have your photograph on the cover! Congrats! hey amanda, you did its great for you do wonder-ful work . that picture of that baby is just wonderful so sweet, and i thought you just did your dogs for fun, girl your great and am going to get the issue and keep it because i meet you here on the computer and when you get big and you well ill come meet you to get you to sign it and meet miley and howie, i show them to everyone, lol they are top boston in my book, girl keep up the good work, GOD IS SMELLING DOWN AT YOU ,take and ill keep chicking on how your doing all this have fun, say hi to your kevin for me, bye bye now. What a dream this must be for you ! I can only imagine! Keep up the great creative work. Congrats on a huge accomplishment! Congrats Amanda! that picture is awesome! I want my issue NOW! How cool is that!?!?! Congrats! Now I can’t wait to get my issue in the mail! Now you just might get really swamped with font requests because you’re famous!!! How awesome! I’m so excited for you! WAY TO GO AMANDA!! Woooohooo! How exciting! Congratulations!!!! Yeah! How awesome :) Congratulations! What an awesome feeling. I knew sooner than later your site would be public- You create beautiful fonts, tutorials and recipes! It’s all wonderful & I appreciate it! Keep it up! Wow – congrats on the cover and the article. That is so exciting. You rock! COOL! How neat! Hey, we know you have many talents. I’ve made many of your dishes and have used your fonts! I hope the article mentioned you were a good cook also! The picture is great! Can’t wait to read the article! CONGRAT. beautiful work was discovered! Congrats! Congratulations !! Such a beautiful picture and looks fantastic on the cover, I’ll have to look for the magazine. Love your blog, I check often. Congrats! That is such a great photo and your fonts are, as always, cute as a button. Thanks again for the awesome website. CONGRATS! That is just awesome : ) : ) : ) And I think you look great, like your sweater btw! oh you must be on cloud 9! am happy to see you recognized. And in such a huge way!!! Amanda – Once again, you’re amazing! I do remember last year when you posted all those pictures and I remember thinking, what a cute girl! Congrats girl!! Congratulations! That is so cool. BTW when are we going to see some layouts from you? OMG! I’m so excited for you! THE COVER?! sheesh! :) that’s awesome :)!! That’s so awesome, your generosity is paying off! wow the cover!! thats awesome!! congratulations:) most people could only dream of something like this happening!! wow the cover!! thats really awesome!! congratulations:) most people could only dream of this happening!! woo hoo! love you blog, love the picture, and love your recipes. Congrats – that is an adorable pic! UHU!!!!!!!!! I’m so happy for you, you totally deserve it!!!!!!!! You are an example of hard and wonderful work, and yes, you are a lot of skills!! Love your pictures and I hope one day I can take some with the same quality as yours!!! I’m very happy!!!!!!!!!!!! Congratulations! You’re such a talented and wonderful person, you deserve it! I’m in love with your site. Congratulations for the wonderful recognition of yout talents. That is so awesome! And so deserved, you have incredible talent. I’ll be looking forward to picking up this issue. Congratulations!! Congratulations! that is such a wonderful honor to have that on the cover of such a popular magazine! Wow. Good for you. I love everything that you do. I’m crazy about your website. You deserve the recognition! My copy of CK came today, I read that and thought that was your name! Congratulations – that is a great picture! Keep up the good work Amanda! I’m so happy for you. Everything you do is great and this just proves it. you are totally famous!! 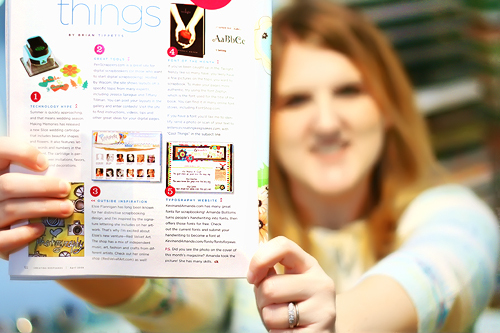 To be mentioned in a magazine is a BIG deal (top 5-wahoo!! ), but to have the photograph you took on the cover-AMAZING! Congratulations!! That is AWESOME! What an honor! I’m so so so excited for you!!! 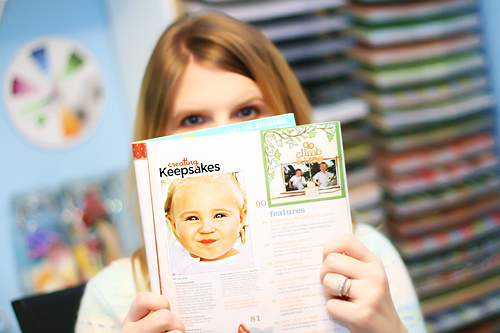 I would seriously have screamed if I’d seen one of my photos on the cover of a magazine!! !